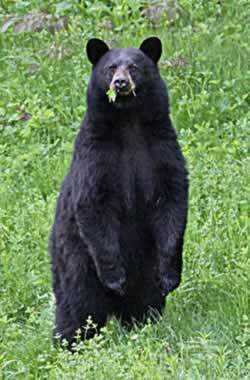 September 1 marks the start of the bear hunting season in New Hampshire. Bears may be hunted over bait, by stalking or with hounds. The statewide bear population has experienced modest growth over the past two decades and is at approximately 6,100 animals. The population is strong throughout the state and abundant hunting opportunities exist in most areas. Bear management objectives vary by region, and hunting opportunity has been expanded in some regions in an effort to stabilize bear population growth. Bear hunters may not hunt bear over a bait containing chocolate or any cocoa derivative; read more about this important rule. In addition to baiting for bear on private land, hunters may bait for bear on lands owned or managed by the Department, as well as the federal government, including the White Mountain National Forest. When baiting bear, no person shall have more than one active bait site within an individual trapping unit as described in 303.13(c). Learn more about hunting bear over bait.